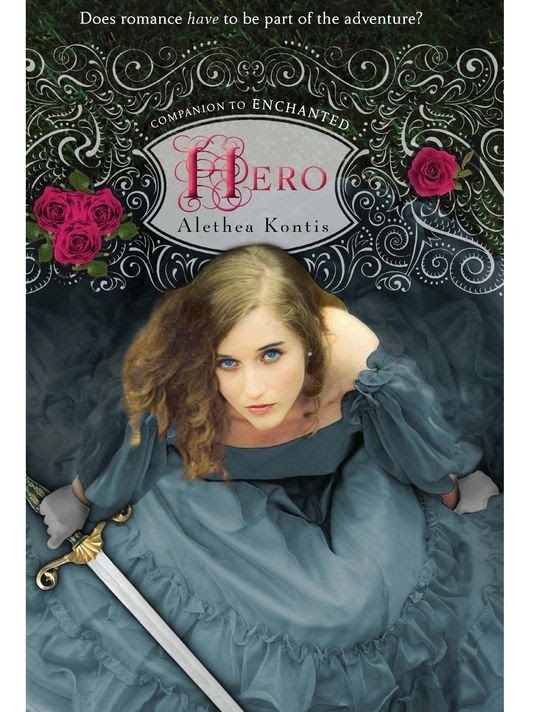 A while back I came across a book at the library that jumped out at me: Enchanted by Alethea Kontis. It was a delightful mash-up of fairy tales that I thoroughly enjoyed. One night while searching my library's ebook collection another book jumped out at me: Hero by the same author. This is not a sequel and knowledge of Enchanted is not necessary to read it, but the reader's experience is definitely enhanced by it. Saturday is the sixth sister in her rather large and odd family. All of the other sisters have been granted some kind of power by their fairy-aunt Joy, except for Saturday. Saturday is the most "normal" of the sisters and concentrates on helping her father and brother cut wood and help maintain the house. When a visitor arrives with a message that her mother's older sister has died, things start to change for Saturday. She mysteriously summons an ocean--and her older sister the pirate queen Thursday--and manages to get kidnapped by a powerful witch who thinks she is her older brother Jack. Saturday is not the only one held captive by the witch. A young man cursed to appear as the witch's daughter (who escaped years earlier) and a shape shifting chimera are also residents of the mountain above the world. The young man Peregrine just happened to have been having visions of Saturday all of his life and naturally falls in love with her. Hero has just as many fairy tale references and the framework that fairy tale readers love with a bit of a twist. Instead of a "damsel" in distress, Saturday is the hero and she saves Peregrine. Although she is posing as her older brother and he is pretending to be the witch's daughter, it's still pretty girl power strong. I loved Saturday and her strength. She is not a weak helpless maiden waiting for someone to rescue her. As we expect from fairy tales there is romance and instalove, but it wouldn't be a fairy tale without it. Hero was just as entertaining as Enchanted and I can't wait to share it with my daughters someday. I look forward to reading more companion books about the other sisters.